One of the many things I love about Europe is the easiness to cross the borders. You walk slowly one afternoon and one step ahead you are in a new country without even noticing the change of landscape. A bit later you might hear the sound of a different language, but there is no official barrier that warn you, or even worse, stop you, from moving freely. Shortly upon arrival in Konstanz, we saw close to the entrance in the old city a sign mentioning the exit to a different country, but we were too tired to try another new travel experience after more than 10 hours of driving from Berlin. A bit later in the week, we took a slow walk and we passed on the other side of the border as easy as possible. Gone are the days when a precious visa for Switzerland was obtained after long lines in the front of embassies and lots of documents proving how reliable you are to come back in your far away country. I should appreciate more the present times! 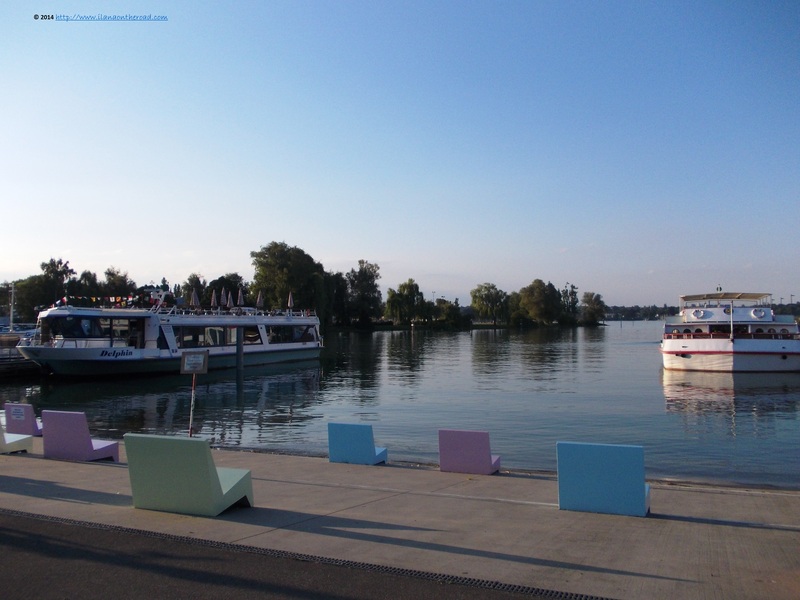 With the train from Konstanz, the station Kreuzlingen is only 3 minutes away. In addition, a regular bus is connecting the two countries all round the day. Kreuzlingen has a population of around 20,000 people and is the second largest city of the canton Thurgau, in the South-Eastern part of the country. 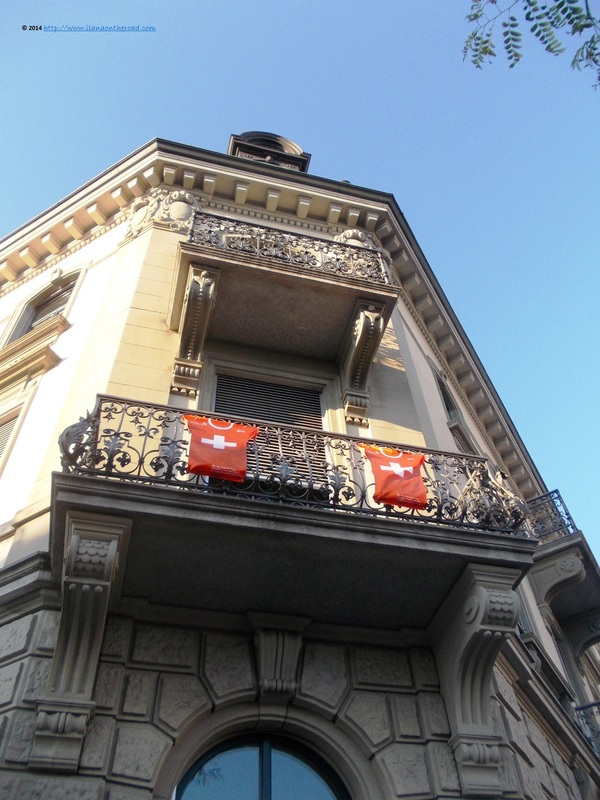 It used to share the same history with the city of Konstanz for a long time, but nowadays, it developed its own German-speaking Swiss identity, as it proved the many local flags hanging out on the balconies and windows of the houses in the old quarter. The streets were almost empty, with the exception of some Italian restaurants without too many customers and some outlet stores. With flowers on the streets and a certain quietness that it is specific to many Swiss localities, there is a certain feeling of peace that conquers the first time visitor. 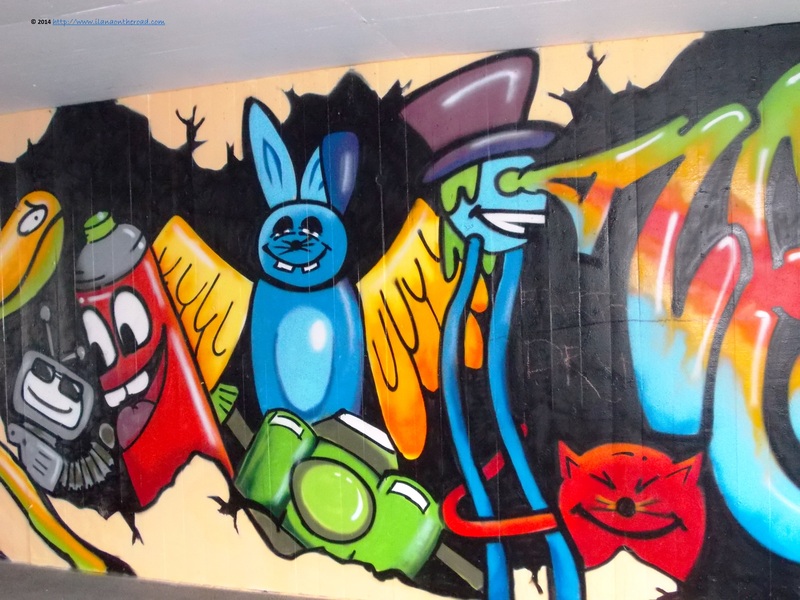 Aiming to break a bit what can easily be misunderstood as monotony, the local authorities commissioned young artists various street art projects that can be found in the most unexpected places around the city. Before the street art was in fashion, there were the many parks and garden that were took care about by the local authorities. In 1932, the main park was arranged by Fritz Haggenmacher, whose works of gardening were famous especially in Winterthur area. 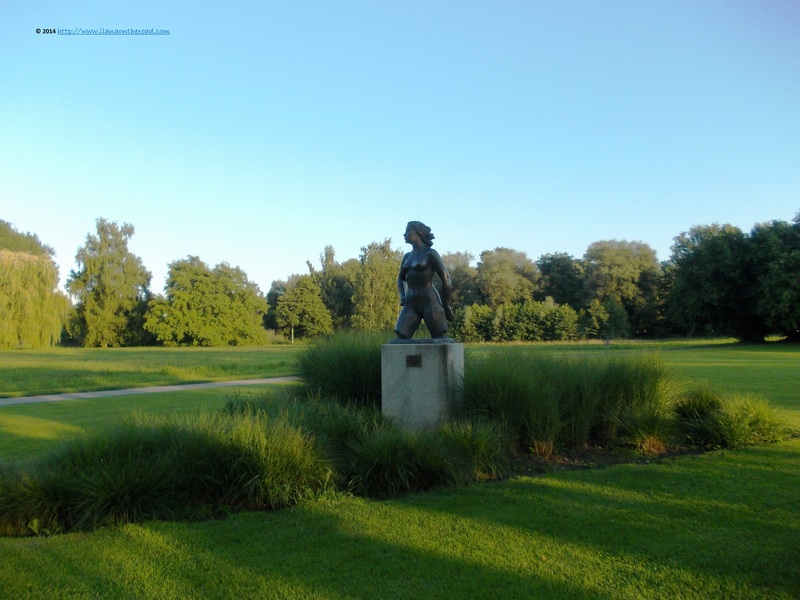 Some of the sculptures were considered offensive by the local mentalities at the time, but resisted the test of time and nowadays are beautifully adorning the public spaces. 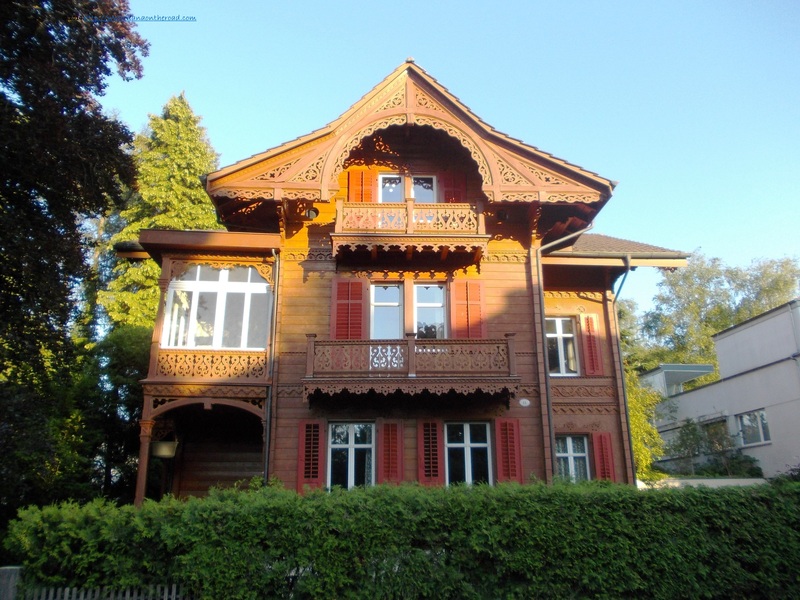 One of the main signs that will show you are in fact in a different country is the architecture, proudly samples of Swiss work: wooden cottages transplanted from the top of the mountains in the middle of the city. Hardly meeting too many people, except some lost tourists from Germany like us, we made our way close to the lake, where it looks more animated. The promenade was inspiring not only to some eating experiences on the boat, but also to meditation near the lake, using one of the generous pastel coloured seats created there. The most animated part was the park though, with people of all ages having their dinner on the grass, children and adults playing together and an impressive number of acrobats choosing to do their exercises in the open air. Lucky me who watched them for minutes, as discretely as possible, trying to catch up at least the understanding of their special art. I did not go that far away to do such practises at home though. 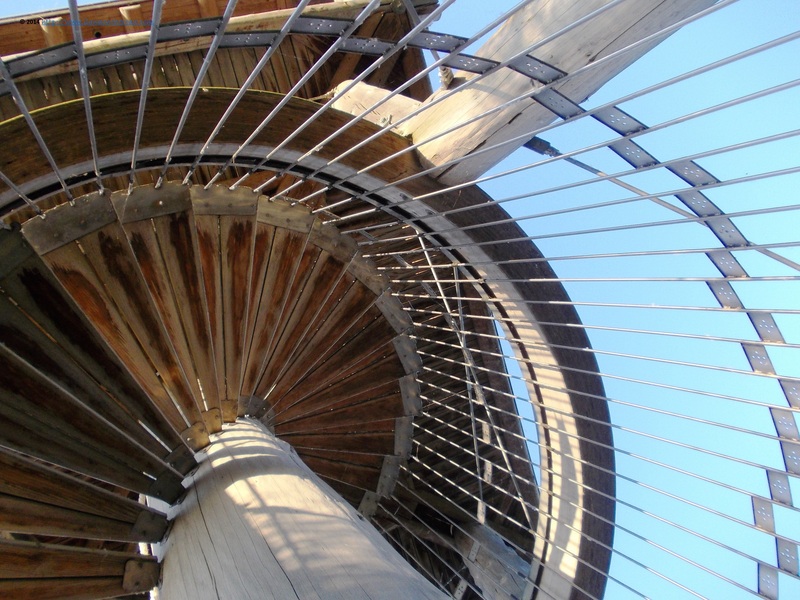 In a corner of the park, there is a small tower from the top of whom you can have an overall panorama over the lake, with its German and Swiss parts coming together smoothly. I took a short video to remember these beautiful moments. Up on the ground, people kept being busy swimming, playing tennis or chilling out in the sun. 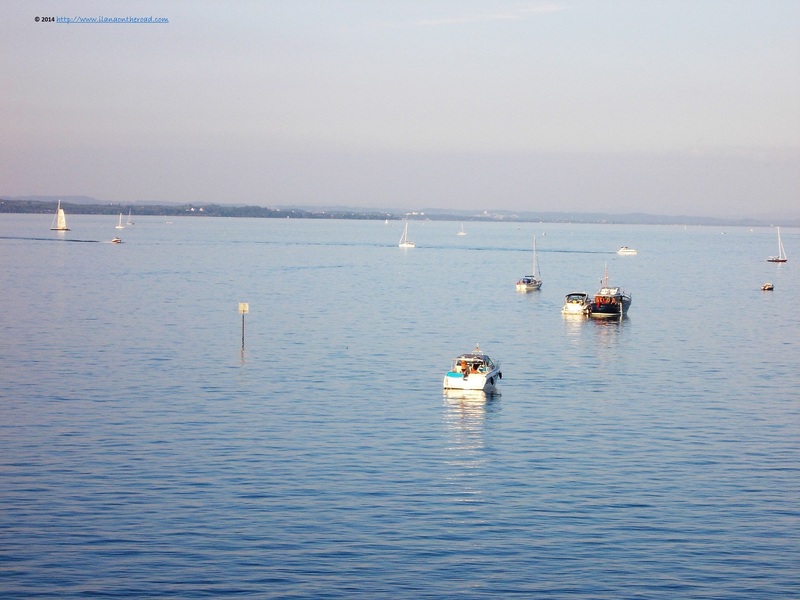 The lake looked more busy in its Swiss part, with small boats colouring the blue surface. In that moment I had a bit of nostalgia for the beautiful Zurich lake where I used to spend carefree hours, reading on a boat. Time for a return, probably! 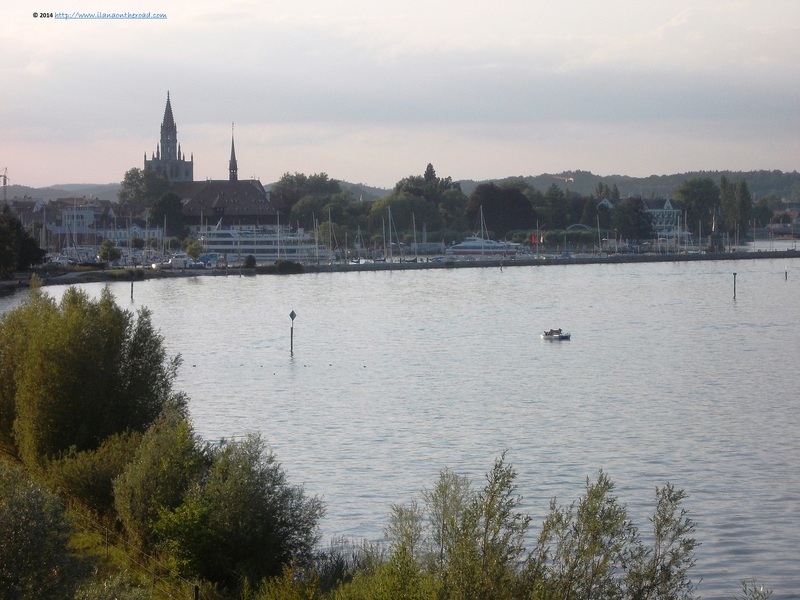 Viewed from Kreuzlingen, Konstanz looked impressively busy and with much more offers for tourists. 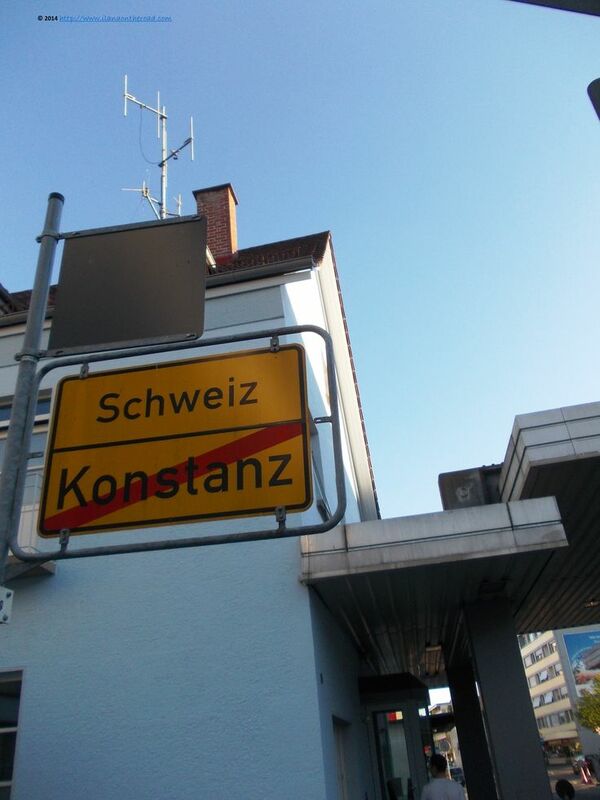 For the local Swiss people, this city matters as well for its good and affordable prices, many of them preferring to do their basic supplies every week from the German side of the border. Similarly, those living close to the French border, are rather shopping from France, and instead of speaking about 'Swiss invasion', as I often heard I would rather appreciate the smart financial planning combined with the luck of living in a world free of borders. Near the lake, there were many more temptations for children and their parents: an open air theater, a minigolf and many playgrounds. Together with some joggers and bikers, we went closer to Bodensee Arena, where the local soccer team FC Kreuzlingen is representing the Swiss football since 1905. 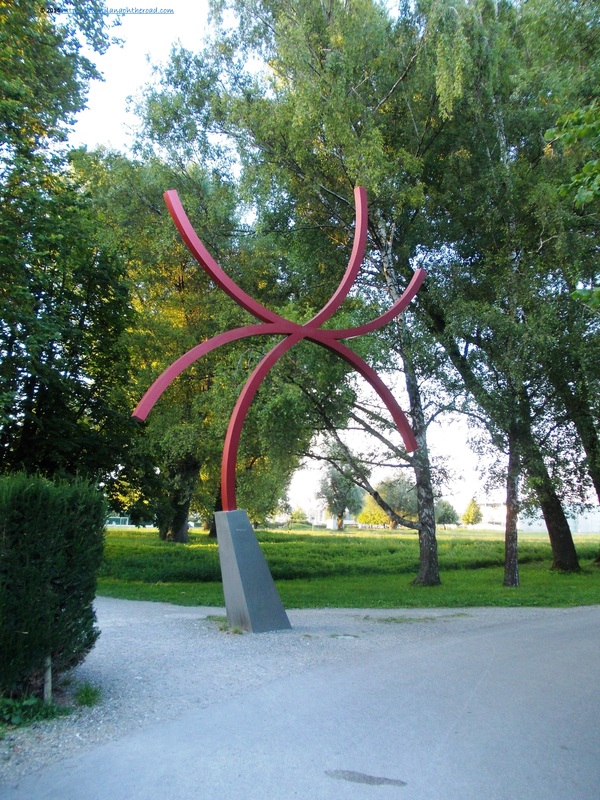 If not my journalistic eye ready to spot the most curious details, we would have not notice that we are back to Germany, a red spider-like metal sculpture symbolically outlining the passage. 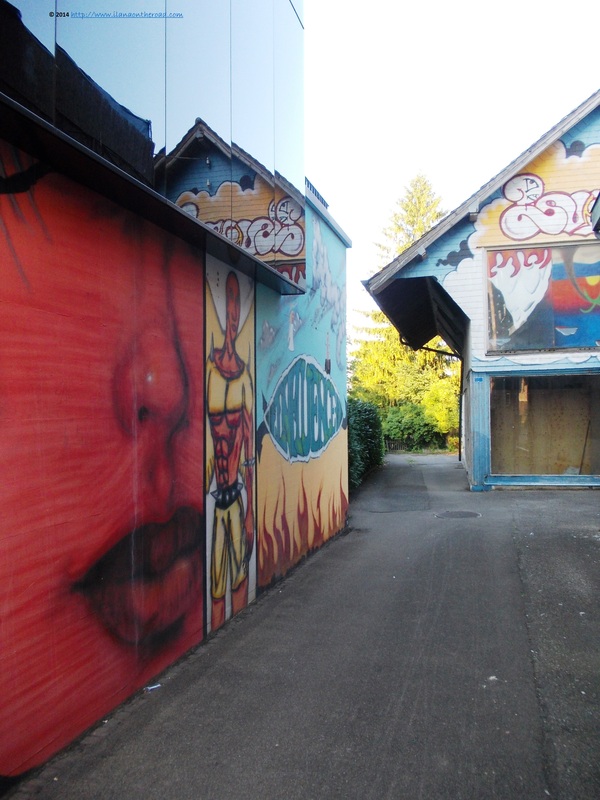 Kreuzlingen might not be a top destination in Switzerland, but it makes you curious to see more and more from this interesting country. Thus, I promise to be back soon!